I made the decision to start a new blog dedicated to the English Idiomatic Expressions exclusively since my English Harmony blog started getting a bit cluttered up with all sorts of blog posts and videos. I had to choose between ditching the idiomatic expression videos altogether or finding a new platform to feature them, and it goes without saying I went for the latter. After all, judging by my visitors’ comments, all these videos come in handy for those foreign English speakers out there who are working on their fluency, and I also have to admit that I’m kind of used to creating these videos on a regular basis. Frankly speaking, I would miss sitting down in front of my Flip Mino HD camcorder and talking to you, my friends, so here you go – you have two blog to follow now – English Harmony and Easy Idioms! Well, of course let’s not forget my third blog Accent Adventure which is all about improving one’s English pronunciation and accent, so you may want to check it out as well. You never know when all that information might come in handy for you! 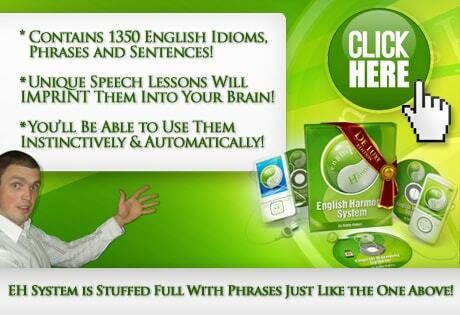 And by the way – did I tell you today’s English Idiomatic Expression is ‘come in handy’? I’ve used it a couple times already throughout this blog post, but if you want to find out more about its application in real life English conversations – check out the video above! Thank you for this idiomatic expression! PS: Thank you for all your job! Yes, I started this blog recently and it’s going to be dedicated to idiomatic expressions exclusively! I didn’t know you started this blog until you mentioned it in one of your videos at English Harmony! I think it’s a great idea. Idioms are the spice of language and they are definitely worth learning. Actually, I’m also posting idioms and phrases on my blog but they are aimed mainly at my Spanish visitors. All the best with this new blog.